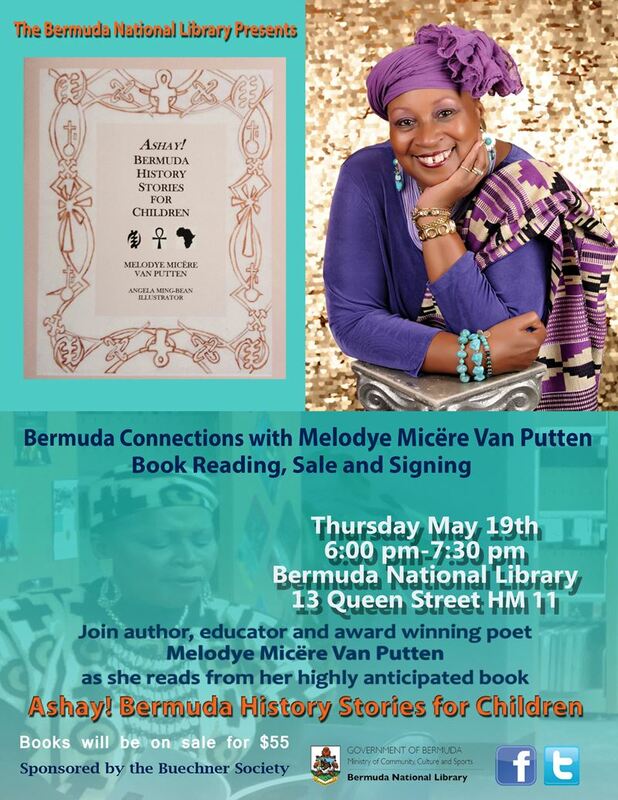 The Bermuda National Library will host the book launch of Melodye Micëre Van Putten’s book “Ashay! Bermuda Stories for Children” this Thursday, May 19th from 6 to 7:30 pm on the second floor of the adult library. There will be light refreshments, a reading from the book and book signing. “Ashay! Bermuda Stories for Children” is a full, vibrant color coffee-table book of over 150 pages, printed on thick, glossy paper. Beautifully illustrated by Bermudian artist and educator, Angela Ming-Bean, it was years in the making and serves to assist parents and grandparents with the task of educating their children. “Ashay! Bermuda Stories for Children” includes the stories of Sally Bassett, Joseph Rainey and Mary Prince; and also discusses the formation of the Bermuda Industrial Union, the Bermuda Workers’ Association and Dr. E.F. Gordon’s pivotal leadership role. It also includes the 1959 Theatre Boycott and National Heroes Dame Lois Browne Evans and Dr. Pauulu Kamarakefego [Roosevelt Brown]. Individual stories conclude with glossaries and study questions, and the book ends with lessons for today’s young people. The intention and purpose of Ashay! Bermuda Stories for Children is to provide an exciting and important opportunity for parents and grandparents to be able to teach their children the history armed with academically based and empowering information.